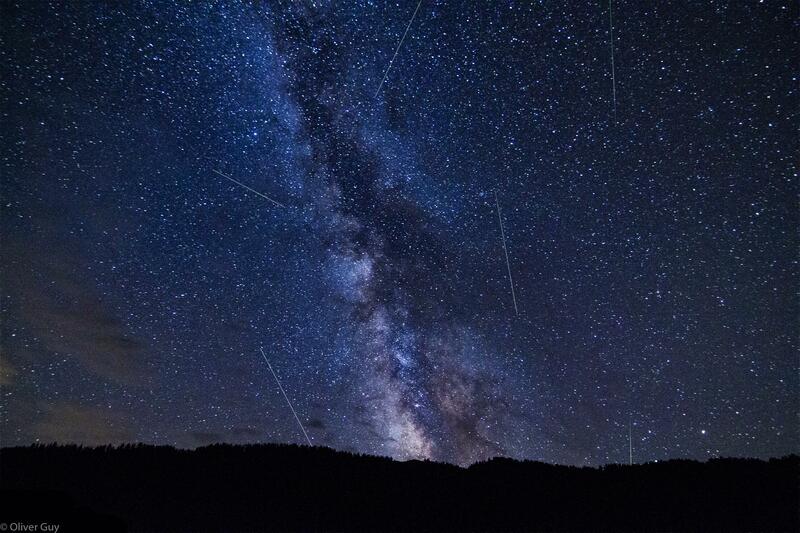 The Perseid meteor shower dazzles skywatchers every year around mid-August as the Earth passes through the debris left by Comet Swift-Tuttle. This year, I traveled to the recently accredited Central Idaho Dark Sky Reserve to watch the event in some of the country’s darkest skies. My visit was hosted and arranged by Chevrolet as part of an unpaid media preview highlighting the Chevrolet Bolt EV all-electric vehicle and the 2018 Perseid meteor shower. The Chevy team provided a Bolt EV for my 2-and-a-half-hour drive from Boise to showcase the vehicle’s 238-mile (383 km) range. Coming back from the lake, I met a couple who had come to Stanley specifically for the Perseids as well. Originally from Arlington, Virginia, the two had relocated to Colorado and were attracted by the Central Idaho Dark Sky Reserve’s accreditation last December by the International Dark-Sky Association. They had previously watched the event from Great Basin National Park, Nevada, which the same association had certified as an international dark sky park in 2016. That night would be the peak of the shower, they told me. “Be sure your kids sleep in the dark, you sleep in the dark, and tell all your friends to sleep in the dark,” Pauley implored the group. He then began his guided tour of the night sky. He pointed out Arcturus, near the Big Dipper, and hopped from the constellation’s bowl to Polaris, the North Star. But just then, a spectacular meteor streaked across the sky, pulling our focus away from our host’s tour. Pauley then directed our attention behind us, far from the action of the meteor shower, to the center of the Milky Way, in the constellation Sagittarius. When I asked where I could find Andromeda, our closest galactic neighbor, he pointed me toward a dull white glow in the galaxy’s namesake constellation, right next to Perseus. Lifting my binoculars to observe the galaxy in greater detail, I saw countless previously invisible stars, slightly too dim to see unaided, which immediately disoriented me. The number of meteors you see in a night depends on many factors: sky conditions, stream density and size, time, location, and luck. For the Perseids, the debris stream is large enough to give all locations pretty much equal views, according to Mike Hankey of the American Meteor Society. But many meteor showers will hit certain locations harder than others. You can also glimpse more meteors in a dark sky, because you can see the fainter ones that aren’t visible to people in bright cities, he said in an email. The shower continued long after I joined the last of the shivering group to leave the site around midnight. Before we departed, Pauley brought out a sky-quality meter. The device measures the sky’s background luminance, which corresponds with light pollution. A perfectly unlit night sky gives the maximum readout of 22 on the device, Pauley said. Somewhat counterintuitively, lower numbers indicate brighter conditions. That night, the meter registered 21.24, just shy of perfect. Editor’s Note: Harrison Tasoff traveled to the Central Idaho Dark Sky Reserve on an invitation from Chevrolet as part of an unpaid media preview event highlighting the Chevrolet Bolt EV and the 2018 Perseid meteor shower.